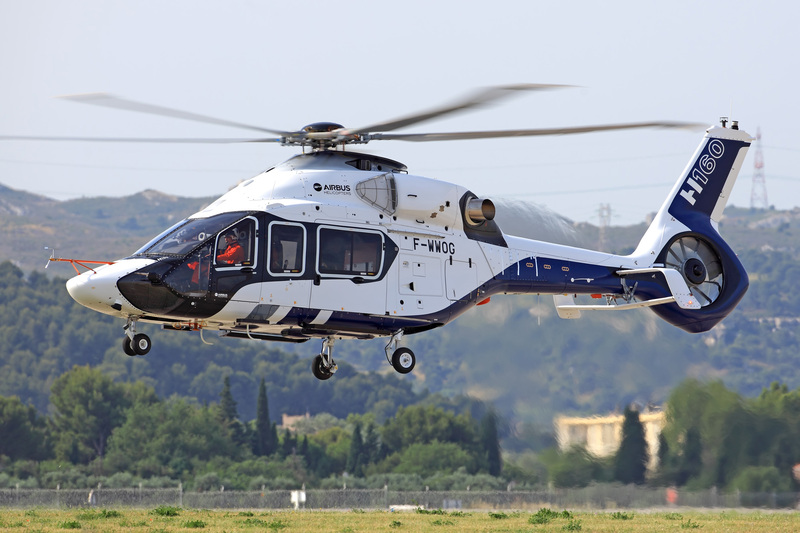 The Airbus Helicopters H160 medium twin made its first flight on Saturday, June 13, at Marignane Airport, where the manufacturer has its headquarters. The helicopter took off at 9:30 a.m. and the flight, mostly hovering, lasted almost 20 minutes. Two flight-test engineers were on board, along with test pilot Olivier Gensse. “We felt virtually no vibration; this is very promising,” Gensse said. The first ground run took place on May 27. Pratt & Whitney Canada PW210 engines powered the first flight but they will be replaced, late this year or early next year, with Turbomeca Arranos. The latter will be the only production engine for the H160, since Pratt & Whitney Canada decided not to pursue a growth version of the 1,100-shp class PW210E, leaving the choice to the 1,100- to 1,300-shp Arrano. “This has not changed the schedule for us,” Philippe Couteaux, Turbomeca's executive v-p of strategy and development, told AIN. Between January and March, Airbus Helicopters started using two new kinds of iron bird to smooth the development of the helicopter. The dynamic integration testbed, dubbed “dynamic helicopter zero” (DHC0), has been designed to ensure the maturity of the flight control system, rotors, drive shafts, gearboxes and engines (initially the PW210E), among other things. It will continue to be used during the flight-test and certification phase. Turbomeca has already delivered Arranos for DHC0. The system integration testbed, called “System helicopter zero” (SHC0), comprises electric and hydraulic systems and is also a tool for flight-deck development, Gensse explained. Airbus plans to begin delivering the 12,000- to 13,000-pound mtow H160 in 2018.